You can thank Marian over at "Seams to Be Sew"
She is giving this pattern away for free, just for the holiday weekend. For you Canadian folks... there's a version for you too! them, when you did this one. They are loving their new addition! With a face like this...who can blame em! Have a safe and fabulous 4th. Joan, when I saw the pic I felt that it had something to do with you. The moose is adorable. I've always had a spot in my heart for big men. I used to be a rather petite female and have had many women asked me why the little gals and the big fellows were attracted to each other. My first husband was 6'7" and I'm 5'2". My second husband was 6'2". I wasn't the pursuer in either relationship. I just smile and tell them - opposites attract. I'm beginning to think some meese just might have to make their way into a quilt or two or some grandchildren. Each time I see one of your creations come to life, I'm enamored. Thanks for sharing and brightened the 4th and reminding that the moose need freedom, too. He is rather cute. Love the background fabric. Hope you had a great holiday! SEW cute! have a happy and safe 4th! 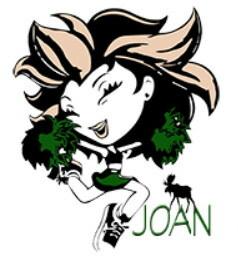 How cute Joan! Thanks for sharing the link to Marian's pattern! Joan, your quiltlet is so darling. Seeing Marian's pattern come to life is such fun!